The Renogy 100W Eclipse Solar Suitcase is a convenient and portable power solution. The Renogy 100 Watt 12 Volt Eclipse Solar Suitcase is an entire solar power system incorporated into one compact package. Built with the most efficient monocrystalline solar cells that Renogy has to offer, this power unit weighs a mere 20. 3 lbs. 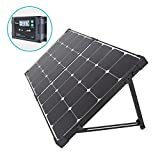 This lightweight suitcase includes two 50 Watt Monocrystalline Solar Panels, one 20 Amp Voyager Charge Controller with an LCD Screen for power regulation, one 10ft tray cable with alligator clips for easy connection to the battery, and protective casing for safe portability. This Eclipse Suitcase is perfect for the customer who is not looking for a permanent or semi-permanent installation. Equipped with a carrying handle, sturdy fold out legs that allow for varying degrees of tilt, and industry standard latches, this suitcase is a great off-grid companion! Eclipse fascinated, but will it yield more interest in solar power?